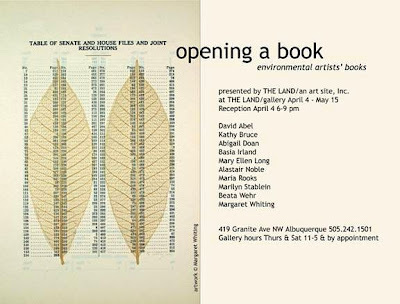 Opening a Book: Environmental Artists' Books opens this Saturday, April 4th at THE LAND/gallery in Albuquerque, NM. If you will be in the area and have not yet visited THE LAND/an art site's new exhibition space, this a great opportunity to see and support land-based art in New Mexico and beyond. Saturday's opening reception will be from 6pm-9pm. You can read more about upcoming LAND events and projects here.